My sister lived on a Spanish island for two years and during my many visits, I became fairly well acquainted with Spanish food. Luckily now the UK has caught what could be described as Spanish fever, tapas seem to have become the hot topic, taking over from where Japanese and Pan-Asian food left off. The ‘fine dining’ market has been filled with Spanish Restaurants including Fino and Copita to name a few. El Pirata however has been around much longer than the nouveau Spanish additions and having first visited two years ago, I was blown away by the traditional flavours of the food and the friendly service. Sadly whilst always meaning to go back, I hadn’t gotten round to it, that is until Miss M and myself decided it was time for Date Night. On Saturday morning whilst scouring the internet for new, funky places we could try, sifting between old favourites like Ishtar (post to follow) and Monkey & Me and more recent additions like Suda Thai, I started reminiscing all the yummy delicacies I hadn’t devoured since my Ibiza trip in August last year and suddenly it was Spanish fair I was after. Wanting something around Green Park, I called El Pirata, only to find that they open at 6pm on a Saturday. So instead I emailed them and received a response at 4.30pm saying they could confirm a table for 9.45/10pm. We showed up at the restaurant and after waiting a minute or two before we managed to get the attention of one of the waiters, we were very casually told to take a seat on the windowsill and that they’d seat us shortly. With the help of the two very friendly diners at the bar, we managed to get the attention of the bar man (in addition to being offered a seat, a jacket and a hug from ‘George Clooney’s non-identical twin’) and ordered our jug of sangria. The service was friendly and quick whilst my little knowledge of key Spanish words did help a little when placing our order. As would be expected from a traditional tapas restaurant, the food arrived fairly quickly. 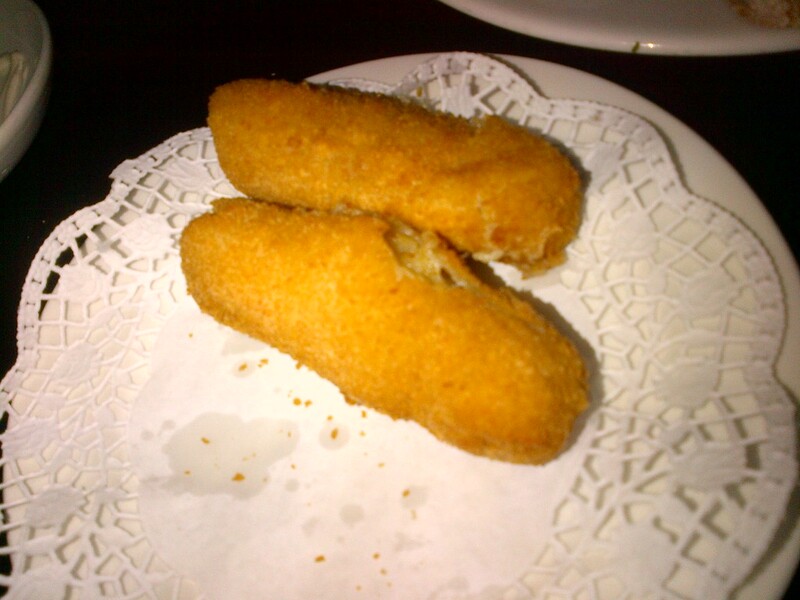 First to arrive was the Croquetas de pollo. Personally I am a fan of croquetas in general, whilst in Spain you sometimes find croquetas de jamon, they only had chicken, fish and veg option on this menu. All I can say is that I was not disappointed (you can see that by the fact that I eagerly tucked in before remembering to take a picture). Next to arrive were the Patatas Bravas and the Champiñones al ajillo. To be perfectly honest, I was disappointed to say the least. The campinones simply tasted of mushrooms and whilst I have no problem with the humble mushroom, I expected it to taste more of garlic mushrooms than just mushrooms. As for the Patatas Bravas, I’m used to the Canarian version – namely Papas con Mojo which has tonnes of flavour, this was a bit bland and could have done with more sauce. Bit of a shame really! The arrived next and I was delighted. The ham wasn’t too fatty and the bread was just soggy enough (whilst not falling apart in my hand) thanks to the salsa like mixture. Altogether the flavours worked great. Miss M commented that the bread was different to the stuff we’d had in Ibiza so resorted to eating the jamon alone. 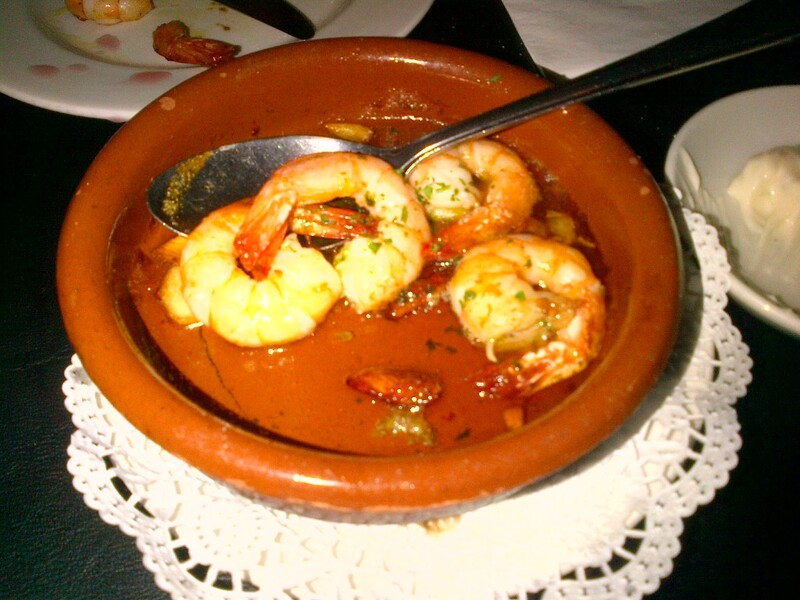 Last to arrive was the Gambas al pil-pil (also known as Gambas al ajillo). Again I was impressed. The prawns were cooked to perfection (it’s very easy to over cook them and end up with chewy prawns) and it was just spicy enough. The only thing I would have added was more garlic, but I think that’s more personal preference than anything else. 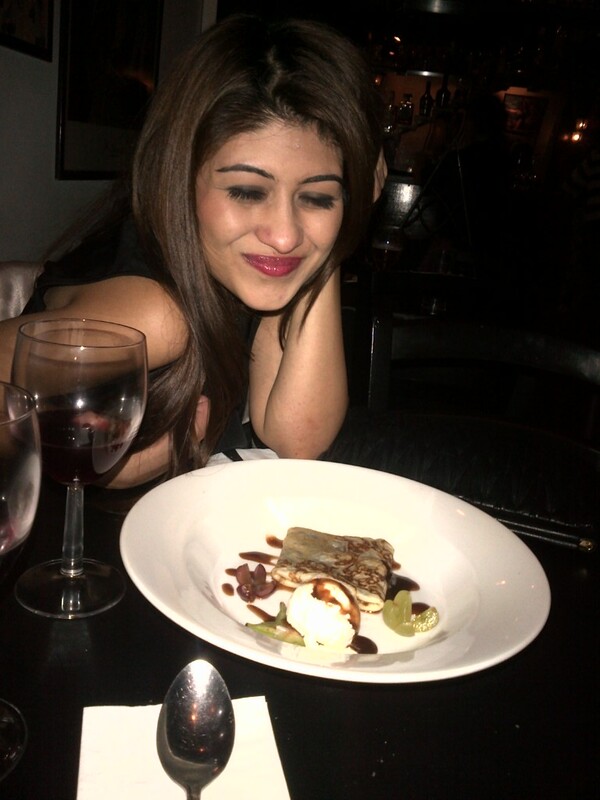 To top it off, we decided to indulge in dessert of Crepe de Chocolate (A pancake filled with chocolate sauce, flaked almonds, served with ice cream.) which was totally satisfying!! On the whole I was fairly impressed. The Sagria was also very drinkable and left us feeling rather merry!! I would definitely go back for another tapas fix and at £25 each it was pretty cost-effective given the location. Gets a thumbs up from me! 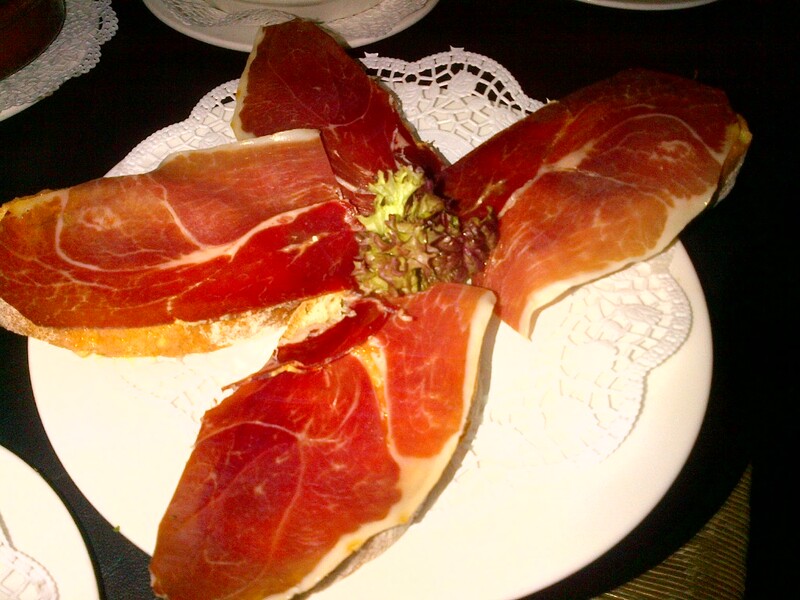 I went to Iberico a few years ago, didn’t find the selection quite as exciting so havent been back. It was an option for this weekend but when I stopped by and took a look at the menu, I decided against it!